Why do we need a reference model? Let us understand the need of such reference model with a real life analogy. Assume I am addressing a group of persons who all understand the language English, then if I speak in English then all of them understand and respond to my questions. But if I speak in some other language which is not understod by any one of them or some of them then all will not be able to understand what I am speaking. When I speak English then I use the proper grammer and words defined in the language English so the people understand what I am speaking. Since I have constructed my sentences using proper syntaxes and semantics, people are able to understand what I am speaking. Similarly the computers in the Network use syntaxes specified by the communication reference models for sending and receiving the data. Thus the computers in the heterogeneous (meaning having variey of hardware and software) network are able to understand the messages sent by each other because they all speak a common langauge specified by the communication reference model. Who have specified the common language and which are they? 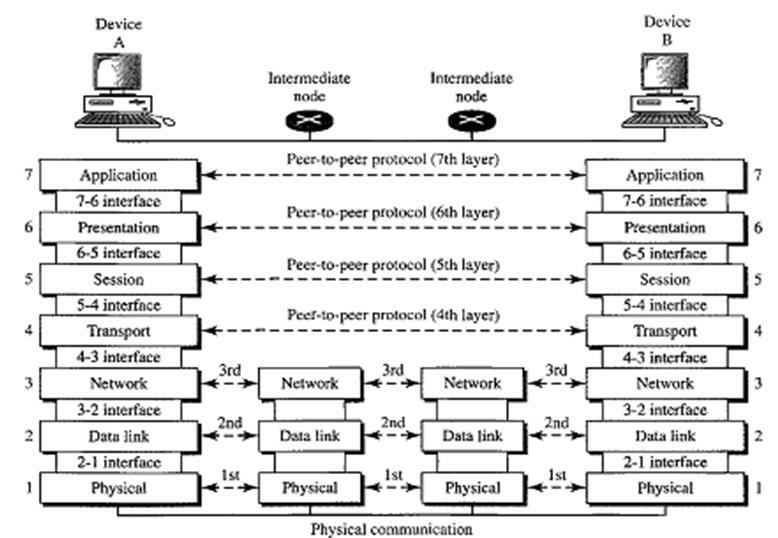 Different reference models exist which specify the method and syntaxes for communication between different computers in the network. The most common reference model is given by International Standards Organization (ISO) which is known as Open System Interconnect (OSI). This ISO-OSI reference model has 7 layers. As shown in the figure above the ISO-OSI reference model has 7 layers. ISO-OSI specifies what should happen in each of the layer but it will not specify the protocol to implement it. What should happen in each of the Layers 7 layers of ISO-OSI reference model? 1) Physical Layer: The job of this layer is to transmit the raw bits over the physical medium and it also provides mechanical and electrical specifications like what should be the amplitude of volatage to represent 1 and 0 and what should be the duration of each of the bit etc. 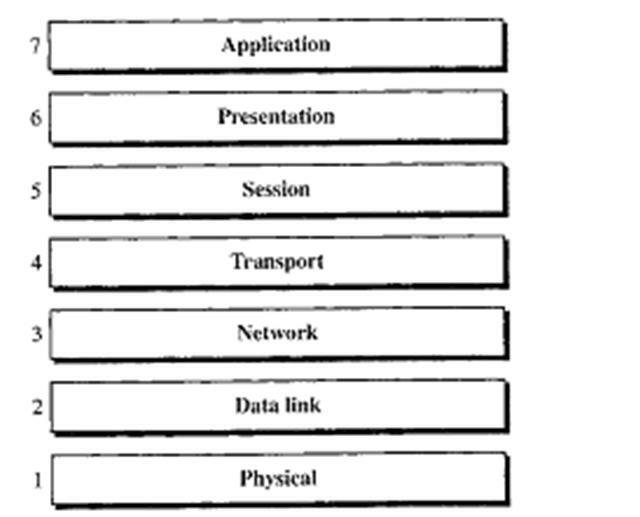 6) Presentation Layer: This layer is responsible for translation from one data representation format to other. This layer is also responsible for encryption, descryption, compression etc. 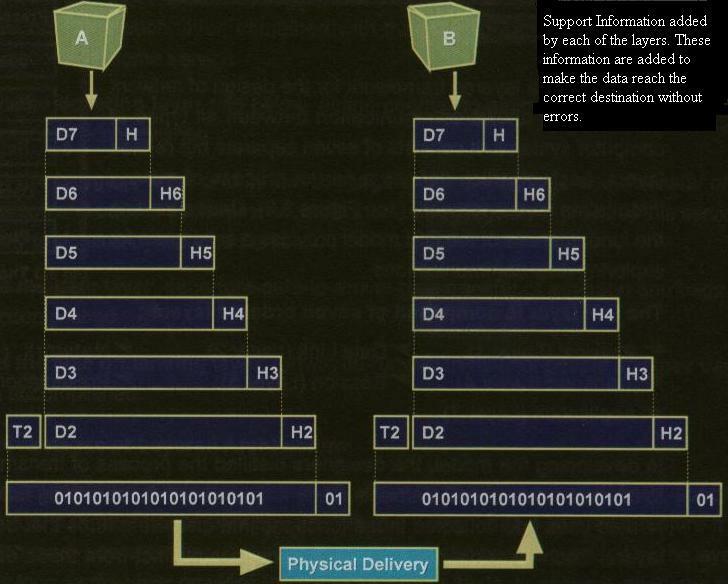 Thus when the stream of bits move from Application to Physical layer each layer adds some information to them so as to make the data reach the correct destination without any erros which is shown in the following figure. What happens when these stream of bits are received by the destination machine? The stream of bits received are passed through the different layers of ISO-OSI in the destination machine. It is passed from Physical to Data Link then to Network from there to Transport then to Session then to Presentation and finally it reaches Application Layer. Each of the layer removes the information added by the peer layer in the source machine. For example the information added by the Data Link layer in the source machine is removed by the Data Link layer in the destination machine. Like this it happens in the all the layers.